Heston is known for having played heroic roles, such as Moses in The Ten Commandments, Colonel George Taylor in Planet of the Apes, Rodrigo Díaz de Vivar in El Cid, and Judah Ben-Hur in Ben-Hur, for which he won the Academy Award for Best Actor. 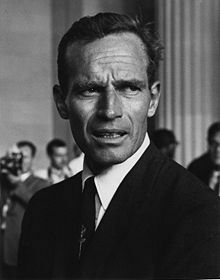 In the 1950s and 1960s he was one of a handful of Hollywood actors to speak openly against racism and was an active supporter of the Civil Rights Movement. Initially a moderate Democrat, he later supported conservative politics and was president of the National Rifle Association from 1998 to 2003. Heston died on Saturday, April 5, 2008, at his home in Beverly Hills, California, with Lydia, his wife of 64 years, by his side. He was also survived by his son, Fraser Clarke Heston, and adopted daughter, Holly Ann Heston. The cause of death was pneumonia. 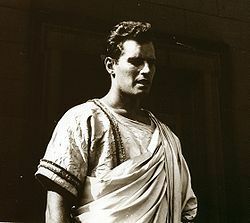 Heston's family released a statement, reading, "Charlton Heston was seen by the world as larger than life. He was known for his chiselled jaw, broad shoulders and resonating voice, and, of course, for the roles he played. No one could ask for a fuller life than his. No man could have given more to his family, to his profession and to his country." Early tributes came in from leading figures; President George W. Bush called Heston "a man of character and integrity, with a big heart", adding, "He served his country during World War II, marched in the civil rights movement, led a labor union and vigorously defended Americans’ Second Amendment rights [to bear arms]." Former First Lady Nancy Reagan, wife of former President Ronald Reagan (who died in 2004 from complications of Alzheimer's disease) said that she was "heartbroken" over Heston's death and released a statement, reading, "I will never forget Chuck as a hero on the big screen in the roles he played, but more importantly I considered him a hero in life for the many times that he stepped up to support Ronnie in whatever he was doing." Heston's funeral was held a week later on April 12, 2008, in a ceremony which was attended by 250 people including Nancy Reagan and Hollywood stars such as California Governor Arnold Schwarzenegger, Olivia de Havilland, Keith Carradine, Pat Boone, Tom Selleck, Oliver Stone, Rob Reiner, and Christian Bale. The funeral was held at Episcopal Parish of St. Matthew's Church in Pacific Palisades, California, the church where Heston regularly worshipped and attended Sunday services since the early 1980s. He was cremated and his ashes were given to his family.